Coffee & Equipment are excited to introduce the Puqpress. Why take the risk of less-than-perfect shot extraction? 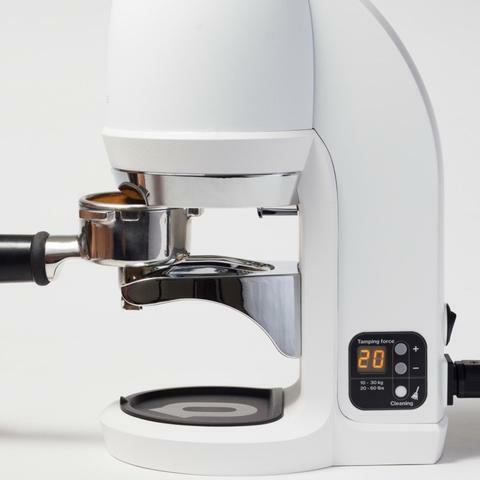 Puqpress automatic tamper ensures perfectly compressed coffee grounds and a precisely level tamp – every time. More precise shots with reduced channeling and improved flavour. Speeds up the workflow – calm baristas and happy customers. Tamper Diameter: 58.4mm (customised, tolerance +/- 0.1mm), suits basket sizes ranging from 58mm-58.5mm. Contact your local Coffee & Equipment sales representative for more information.